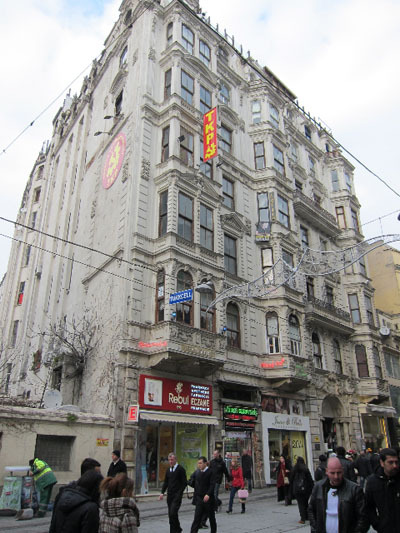 When left alone by real estate developers, the late Ottoman-era hans of Beyoğlu are fertile ground for commercial misfits you’d never encounter in more visible locations. Like mushrooms in a dark, damp place, some of the city’s most individualistic enterprises – tattoo parlors, pirated DVD shops, Off-Track Betting parlors, risqué lingerie shops and used bookshops – seem to thrive inside these decrepit old hans. On İstiklal Caddesi, we’ve watched han after han fall to a swift and merciless wave of gentrification. The courtyard that led to our favorite notary public in the Narmanlı Han is now off-limits as the building awaits a makeover. The Circle D’Orient, home of İnci Pastanesi, seems to be going the same way. One of our favorite places for a beer, the old theater-workers bar in the Atlas Pasajı, is now just a warm memory to us, an office space to others. But just when we thought the whimsy of Bohemian Beyoğlu had choked on the chain stores that line İstiklal these days, we spent some time exploring the last bastion of funky Beyoğlu han life, the Rumeli Han. On a recent exploration of the Rumeli Han’s many wings we wandered past the Turkish Communist Party’s HQ, the Indian Cultural Center, a tango dance center and, on the way in, a knit-cap hat vendor that has defiantly occupied the entrance of the grand old building with towering shelves fixed right over the elaborate moldings of the central arcade. On a rainy day, this arcade is a popular place to flout the indoor smoking ban and duck in for a quick cigarette. We spotted a knot of smokers near the A Blok elevator (out of order), all in different uniforms signifying their employer on İstiklal. Apparently, in the Rumeli Han, freedom, or actually something closer to mayhem, reigns. The unruly spirit of Rumeli Han is perhaps best experienced at a music bar that we’d call a roadhouse if it weren’t on the second floor of the han’s C Blok. It is a rambling series of large rooms forming an “L” shape. The stage sits at one end and a collection of booths on the other, with the bar at the elbow. The interior is neglected in a very pleasant way – paint flakes off the walls and collects on the floor and the old floorboards have been left to creak underfoot. As casual as Haymatlos might appear on the front end, the backside is a serious operation. 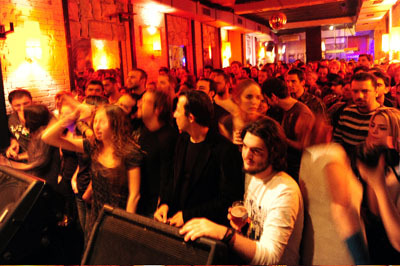 The bar has live music every night of the week and much of what’s on stage is a few beats ahead of current trends. Well-known performers of Balkan music, rembetiko and Turkish jazz play weekly but, more significantly, the place seems to coax unusually good performances out of no-name groups. 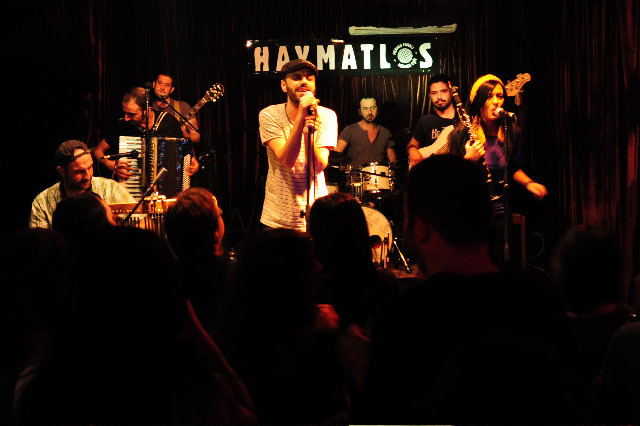 On our first visit to Haymatlos, we were blown away by a bawdy young singer in a red wig playing with a Balkan band. She sang a jazzy song and then started screaming like Ozzy Ozborne on the next one as an accordion honked along behind her. We danced and drank cheap beer all night shoulder-to-shoulder in a thick Haymatlos crowd. Here, in the same swaying room, were outcasts from Asmalımescit in dreadlocks and hippy pants, aging leftists, a few slick local “akşamcıs” and the young and moneyed Beyoğlu hip – a demographic snippet of the neighborhood today. Perhaps there is no such thing as Bohemian Beyoğlu anymore, or maybe it is evolving into something else. Haymatlos, which means “homeless” in German, has a refreshing come-as-you-are approach to nightlife. If the Rumeli Han can only survive the neighborhood’s growing pains, this place might bridge the gap between an older, bohemian Beyoğlu and the new. Sadly, the cynic in us tells us to enjoy the fun here while it lasts. Haymatlos is bound to be “homeless,” indeed, just as the Rumeli Han will surely be another shopping mall before long. Note: Open every night 4pm-4am. Happy Hour 4pm-8pm with half-price drinks.10-15 TL cover charge. I loved reading this post. You totally brought me back to my exchange student days waaay back in 1999 when my friends and I used to go to the Atlas Pasaji’s movie theatre’s bar for beer. Sadly, so much of bohemian Beyoglu is gone now, and the misfits, vagabonds, and alternative kids have to go somewhere else (but where?, I wonder). 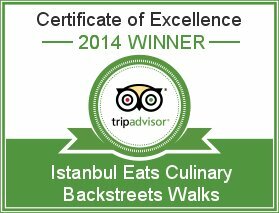 Next time I come up from Izmir, I will definitely try this place. Barbara, that bar in the Atlas Pasaji was special. It was one of the few bars where people actually sat at the bar. Quite a loss. 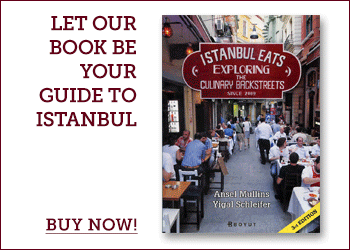 Next time you are in Istanbul, please let us know if any of your old haunts are still open. If not, Haymatlos should do the trick. Ah, yes, actually sitting at the bar! What a concept! 🙂 I do have an old haunt that is still open, but I am not sure if you would like it. It can be a bit sketchy sometimes. In addition to the Atlas Pasaji, we exchange students used to drink at a bar called Neva. If you’re walking down Istiklal from Taksim Square, turn left at the Swatch store, pass the police station on your right, and Neva is on the right. In 1999-2000, an ellilik of Tuborg was sold for 500,000 lira — the current equivalent of 50 kurus — and the bar was known throughout the city as its cheapest bar. It was profiled in the now defunct Istanbullshit magazine several times. Like a decade ago, Neva is still one of those few places where Istanbul’s outcasts can go. Neva is certainly not for everyone, but there is no doubt in my mind that this place will never become a hipster bar. I wrote about it on my blog once, about how weird it was to go back 10 years after my exchange year to find that while Neva was exactly the same, I had changed. 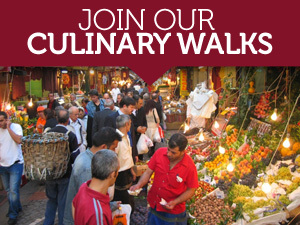 If you are interested, it’s here: http://www.turkishmuse.com/2009/03/history.html. Sigh. The theater workers’ bar in Atlas Pasaji really was a dirty little gem. The bartender was delightfully surly. There was a scarred upright piano in the corner. It was tucked so far back you couldn’t tell whether it was day or night in there. Aah, nostalgia. Do not forget that across the Pasaj there was another more upscale drinking spot that won my everlasting affection because it often blared Soundgarden and Nirvana at 2 in the morning. Can’t remember the name of that long-defunct joint. And, as long as I’m taking a walk down drunken memory lane, a postmortem shout out to Old City. Before it became a stand-up comedy joint…I seem to remember cover bands jamming hard while I spilled beers on sawdust floors doing my white-girl shuffle. Regarding Haymatlos, one recent late evening I emerged from an hour or so of dueling clarinet solos. On my way downstairs I heard the clarion call of distorted guitars and raspy howling. The next floor down an angry young punk band was playing…complete with 4 dudes trying to generate a mosh pit. For some reason they kept picking on some little guy who more than once got sent tumbling into a table. Rumeli Han rocks because in the same building you can get simultaneous ethno-jazz jams and garage band geetars. Now, if I can only find that all-girl heavy metal band Kirmizi again…with its lead singer who sings Metallica while reading the lyrics off a classical music stand.